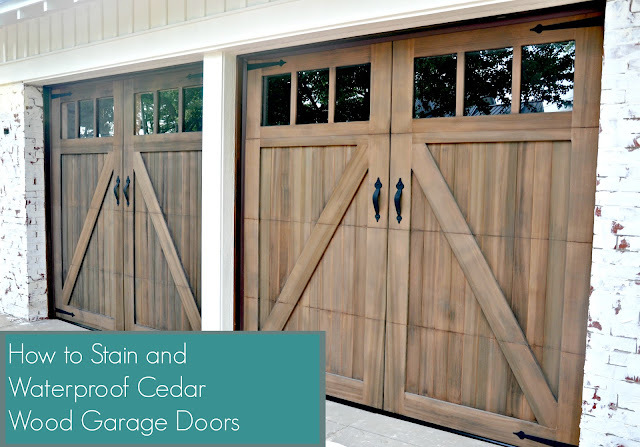 Today, I'm sharing a quick tutorial on how to stain and waterproof cedar wood garage doors. After I spent two weekends unsuccessfully trying to strip found out that our old garage doors were unsafe and we needed to replace them, I quickly decided on Carriage House insulated cedar wood doors. 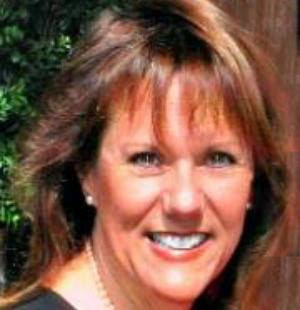 I called the same local, family-owned garage door company that had supplied the garage doors for our last project to assist with doors for the farmhouse. The doors arrived in about eight weeks. 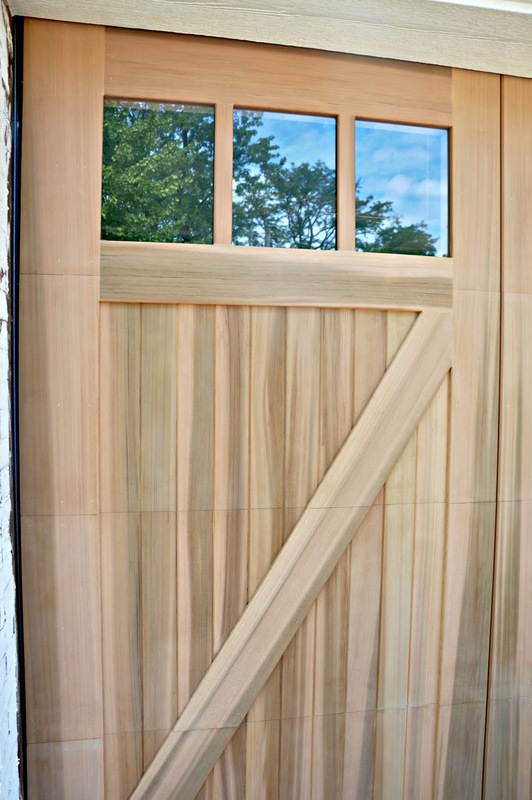 The doors are made of western red cedar but contain an insulated panel in the center which makes them more energy efficient and a better choice for our often brutally cold Midwest winters. As you can see from the photo above, the doors were that beautiful shade of "cedar pink" when they arrived...gorgeous...but not the look that I wanted. 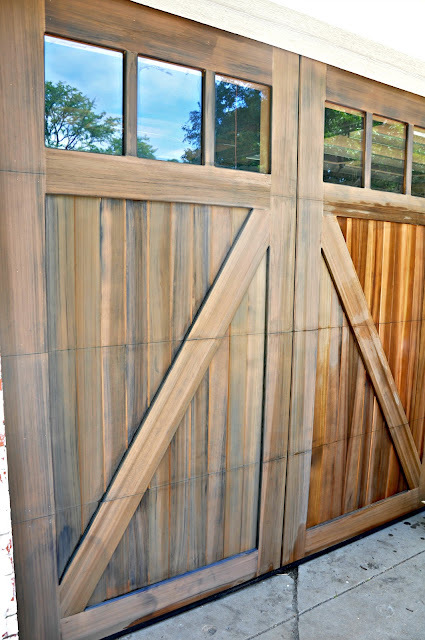 In keeping with the rustic look of our home, I wanted the doors to appear aged and to have some of that great patina that develops over years of use and exposure to the elements. As I researched the various products that are available, I considered aging them with vinegar and steel wool but the lack of control over the finished appearance using this process made me decide that I needed something different. 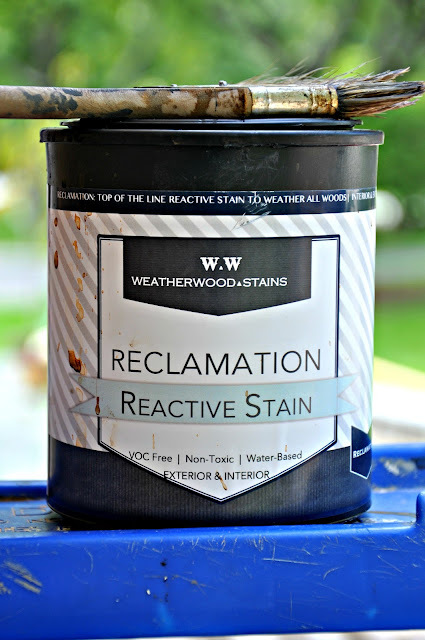 After a little more research, I found the product that I wanted to use: say hello to Weatherwood Reactive Stain "Reclamation". Weatherwood isn't like other stains. It reacts with the tanins in wood to create a beautiful, aged, weathered look in just a few hours. My friend Becca and her hubby have developed a complete line of products that are designed to work with different types of wood to create the soft patina of time and bring out the natural beauty of the wood. You'll see me use these products again in coming months on our new alder front door, our poplar windows, and other wood around the farmhouse as I create the look of hundreds of years of aging without the wait. 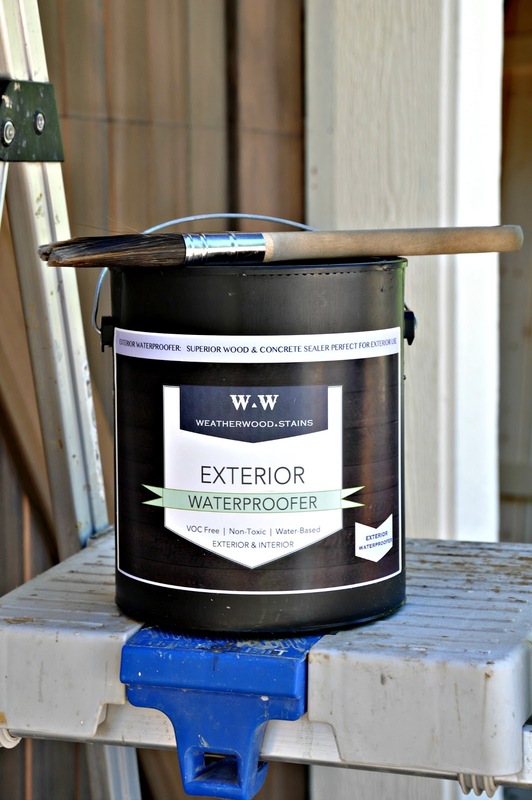 I also chose Weatherwood Reactive Stains because they are no VOC, non-toxic, and water based which makes them environmentally friendly as well as easy to use. To prep the doors for staining, I simply sanded lightly with a fine grit sanding sponge and wiped off the dust. 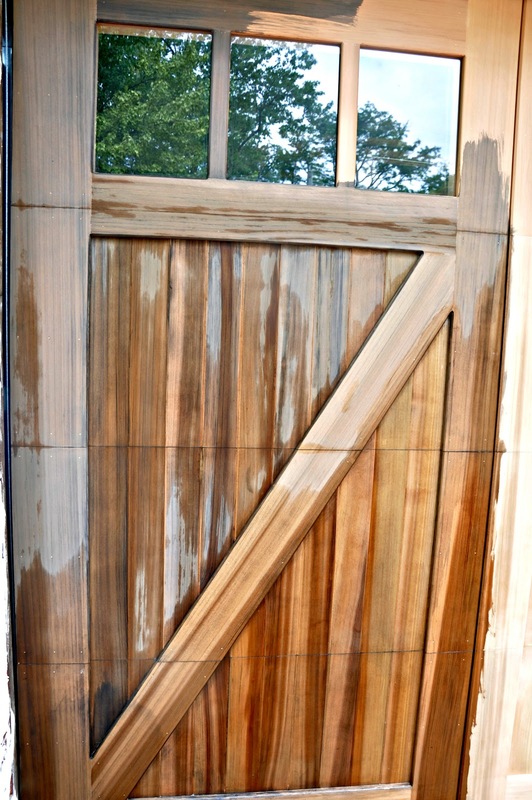 Then, I used a natural bristle brush to apply the Weatherwood "Reclamation" to the front, back and sides of each panel of the doors starting at the top and brushing in the direction of the grain on each board. I applied one liberal coat, "flooding" the surface as it said on the label. Within minutes, the wood began to change color and as it dried, it turned a wonderful shade of soft brown-gray. I allowed it to dry for 24 hours and then applied two coats of Weatherwood Exterior Waterproofer, again, covering all of the surfaces and the side. Application of both products was easy, there was virtually no smell, and clean up was super simple... just soap and water. 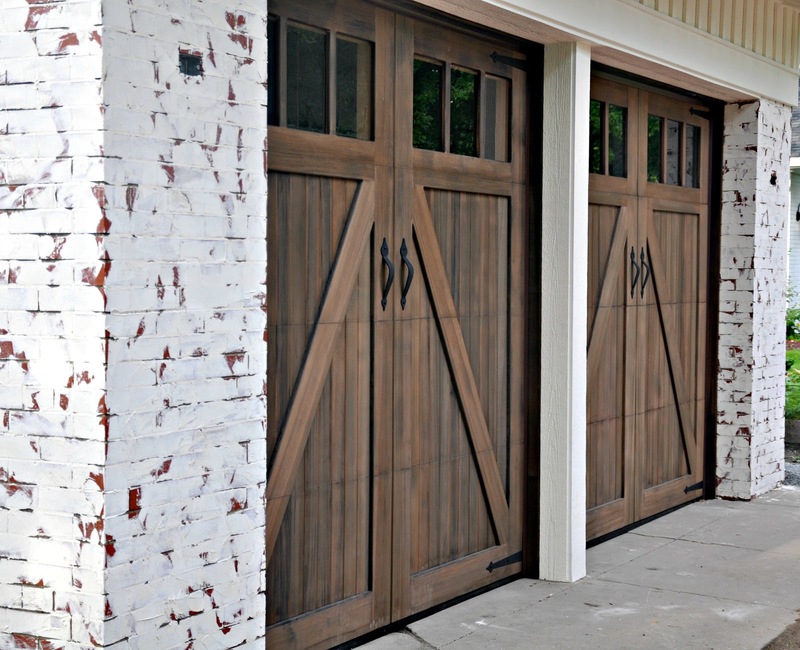 I was able to create the look of years of "aging" on brand new cedar wood garage doors in just a few hours using Weatherwood Reclamation Reactive Stain and Waterproofer. 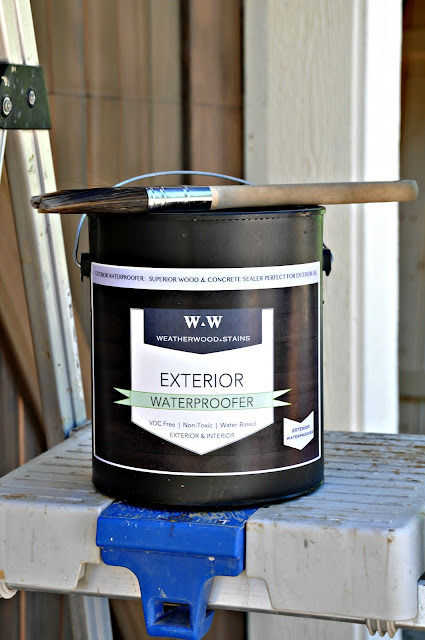 It's simple to use, water based, and no VOC. If you're looking to create instant patina on new wood, this is your product! It also works on previously finished wood but the prep is different. Find more information and some great video on their website. Up next, I've finally finished the tutorial for the Lime putty stucco "German Schmear" that I did on our red brick! Look for a post on that process and a few photos on Monday.